What is the moment, that exact moment when everything changes and the friends you have been, become the lovers you might be? Soul mates from birth Karim and Raheen finish one another's sentences, speak in anagrams and lie spine to spine as children. They are irrevocably bound to one another and to Karachi, Pakistan. It beats in their hearts - violent, polluted, corrupt, vibrant, brave and ultimately, home. However, Raheen is fiercely loyal and naively blinkered and she resents Karim's need to map their city, his need to name its streets and to expand the privileged world they know. When Karim is forced to leave for London their differences of opinion become a painful quarrel. As the years go by they let a barrier of silence build between them until, finally, they are brought together during a dry summer of strikes and ethnic violence and their relationship is poised between strained friendship and fated love. Impassioned and touching, "Kartography" is a love song to Karachi. In her extraordinary new novel, Kamila Shamsie shows us that whatever happens in the world, we must never forget the complicated war in our own hearts. 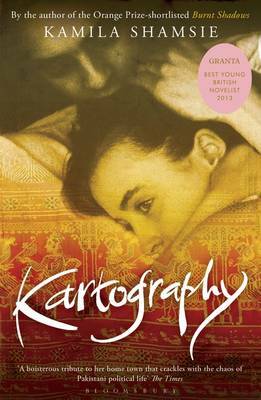 Kamila Shamsie grew up in Karachi and lives in London, her novels include: In the City by the Sea, Kartography, Burnt Shadows which was shortlisted for the Orange Prize for Fiction, A God in Every Stone and Home Fire which was longlisted for the Man Booker Prize in 2017.